Self-certifies interoperability between its homegrown meeting room systems and Microsoft's team collaboration app. An intriguing announcement from last month's Enterprise Connect 2018 came from StarLeaf, which positioned itself as the first to deliver video support and interoperability for Microsoft Teams. I call this move "intriguing" because the expectation based on Microsoft's roadmap was that existing Skype Room System solutions would be the first to migrate to Teams. While StarLeaf does offer Skype for Business room solutions, they're not "Skype Room Systems." Surface Hub is a large-format, touchscreen computer with a camera designed and produced by Microsoft. It can run several applications, including Skype for Business, for room use. Skype Room System (currently in Version 2) is a kit of sorts with a dedicated computer, a specialized kiosk version of Skype for Business, and audiovisual peripherals. While designed by Microsoft, the Skype Room System kits are available from several partners, including Logitech and Polycom. Most center around a Microsoft Surface Pro 4 desktop PC. Microsoft controls development of both of these solutions. Certainly, that end-to-end mindset has benefits, but it's somewhat contrary to the trend of openness. Microsoft turns to partners, such as Polycom and Pexip, to address video interoperability. Outside of that partner ecosystem, StarLeaf created a premium Skype meeting room solution, called GTm. StarLeaf built GTm using its own hardware and software, making sure that it sports an intuitive user interface (green "Join now" button) that is conceptually similar to Microsoft's solutions. GTm has been available for more than a year. StarLeaf is not the first vendor to self-certify its solution for Microsoft communications. 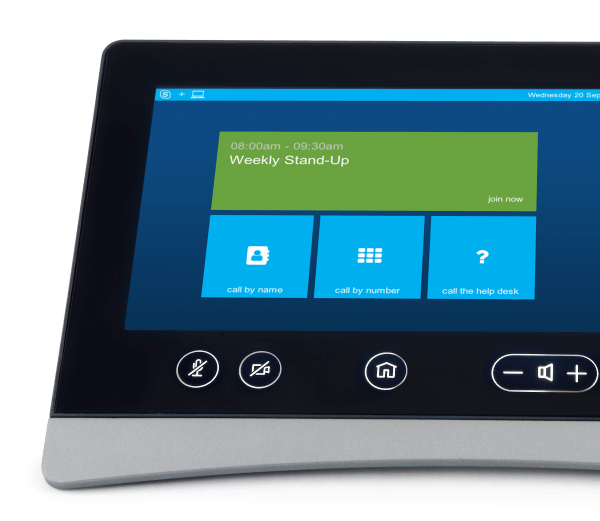 Snom did it years ago (with Microsoft OCS), and that paved the way for Polycom to replace its Microsoft-designed CX phones with its VVX series of SIP endpoints. Acano self-certified video interoperability prior to being acquired by Cisco (for $700 million in 2015). So not only did StarLeaf design and release its own Skype for Business solution, it did so for Teams, too -- before Microsoft video partner Polycom, which has yet to announce a move here. Is there a need? Yes, quite possibly, because one thing is certain about this industry: the demand, even need, for choice. Cisco, for example, has at least five conference room system solutions, separate immersive room solutions, and multiple desktop video options that support small and large format video. The StarLeaf GTm offers an aesthetically pleasing alternative. As a video-first solution, StarLeaf supports optional ceiling microphones, two screens, and a PTZ camera. It also offers a unique management platform for analytics and upgrades. Video-enabling rooms is an obvious priority across the industry as the barriers to video, such as costs and complexity, disappear. Any organization committed to Skype for Business and/or Teams should be considering all available options for its rooms. There are also ways to use older legacy or third-party devices, but they break the Skype for Business (and Teams) ease-of-use benefit. Starleaf, I believe, is the first to offer a fully integrated, yet independent solution for Skype for Business and Teams meeting rooms. StarLeaf is focused on conferencing, and offers a variety of cloud-based meeting solutions. The GTm is exclusively intended for Microsoft's conferencing services. StarLeaf intends to keep the innovations around the Skype for Business and Teams environments coming, and has new features and advancements for both GTm and its integrated management platform on its roadmap.